A “legendary” regional journalist who ghosted weekly columns for two England footballers has died aged 78. Tributes have been paid to John Morrell, left, who worked for the Morecambe Visitor and Lancashire Evening Post during a career which lasted 45 years. John served as chief features writer and entertainments editor with the Post, but was well known as a sports reporter with both newspapers. He also ghosted columns for Sir Tom Finney and Sir Bobby Charlton, who had both played for England and with whom he became friends. At the Visitor, where he began his career in 1954, he covered both Morecambe Football Club and Morecambe Cricket Club matches while at the Preston-based Post, which he joined in 1970, he covered the fortunes of Blackburn Rovers. On one occasion he was banned from the ground of rival club Mossley Town after a particularly controversial match report, while he also introduced markings for players’ performances and player-of-the-year awards to the newspaper. During his time on the Post’s features desk, John reported from all over the world, including a flight to the Falkland Islands from where he filed special reports shortly after the conflict with Argentina ended. John, who retired in 1999, was a personal friend of Dame Thora Hird and her daughter, the film actress Janette Scott, and also of Sir Ken Dodd. 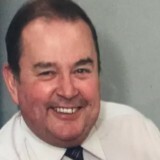 His father Eddie was a leading show producer, comedian and song and dance artiste, was for many years general manager of Morecambe’s Central Pier, and John reviewed shows in Blackpool, Manchester and London when he took on the entertainments editor role. He leaves his wife, Enid, three children, Kim, Nick and Sarah, nine grandchildren and two great-grandchildren. An elder son, Dean, died in 1990 following a road accident. A service at St Paul’s Church, Scotforth, near Lancaster, at noon on Friday 7 April, will precede cremation.